Melbourne’s number one female DJ, DJ AK, has shared the stage with Ne-Yo, T-Pain, and Nick Cannon to name a few. She has mixed songs at parties and dance floors the world over, including Chris Brown and Rihanna’s private party in Melbourne in 2009. In addition to a deep appreciation for music, this artist also loves wearing nail art. 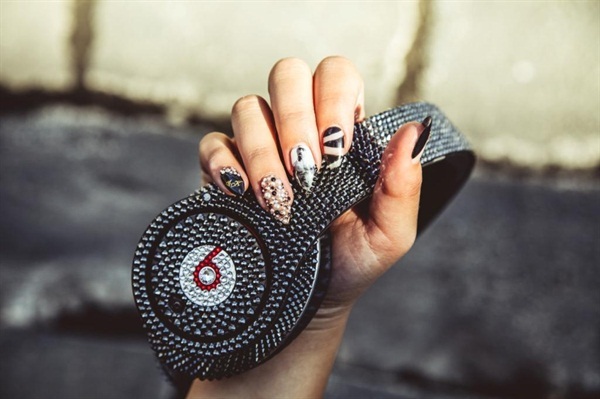 Nail tech and NAILS Next Top Nail Artist Top 12 contender Simone Gilbert of Urban Bliss Beauty Therapy in Melbourne, Australia, recently created a set for the DJ featuring Mariah Carey and Tupac, two of her favorite artists. Don’t forget to vote for Gilbert and your other favorite nail artists in this year’s Next Top Nail Artist Competition. Check out the website to learn more about Gilbert and the other talented competitors.